"This is a twist on Playgroup Granola Bars from this site. I didn't have the stuff to make those (and we love those), so I did my own thing. They turned out great! We normally wrap them individually and freeze them, a great quick snack or breakfast on-the-go!" Preheat oven to 350 degrees F (175 degrees C). Grease two 9x13-inch baking sheets. Mix oats, flour, brown sugar, white sugar, salt, cinnamon, cloves, and ginger in a large bowl. Stir in oil, honey, molasses, and eggs. Mix until well-combined. Pat mixture onto baking sheets using your hands. Bake in the preheated oven until edges begin to brown and center no longer looks glossy, 15 to 20 minutes. Cool for about 10 minutes; cut into bars while still warm. 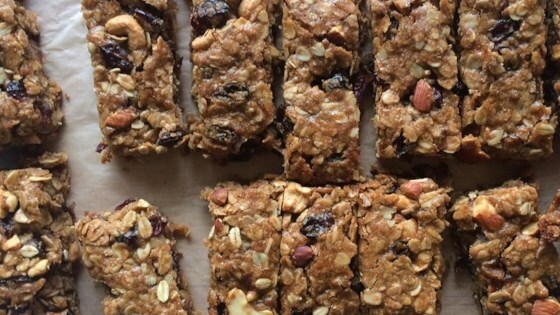 Chewy, healthy homemade granola bars made with oats and raisins.